This mod requires the Advanced Animal Frameworks, A Dog Said… and LBE’s A Dog Said Easy Patcher in order to work. Please, ensure you have them installed and on a higher position in the mods list. Have you watched Game of Thrones? 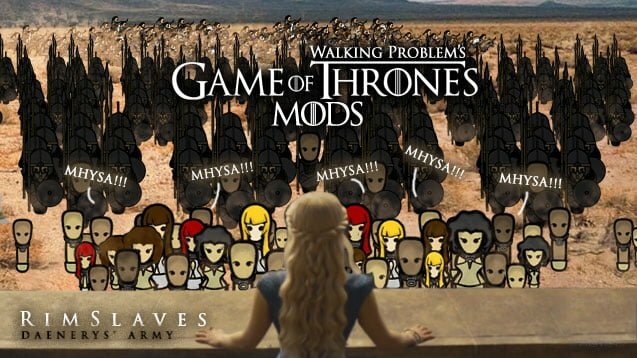 Do you wish you were Daenerys Targaryen leading an army of slaves, maidens, unsullieds and dothrakis? With the RimSlave Mod now you can! 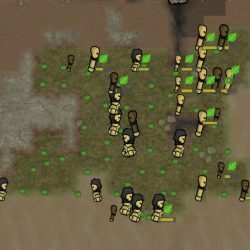 Brought to your by the infamous Walking Problem Studios that had brought you the abominations of Minions and Smurfs Mods – we bring you the Game of Thrones slavery into your RimWorld. Walkblem Slavers are corporations under the massive Walkblem Slavers Holdings that had found success in the Rim Worlds, despite being outlawed in the Glitter Worlds and Civilised Planetary Systems. Walkblem Slavers primarily sells both their proprietary slaves as well as the common free slaves that are already common place in the Rim Worlds. They have no interests in politics and are willing to accept almost all form of goods in the purchase of their slaves. 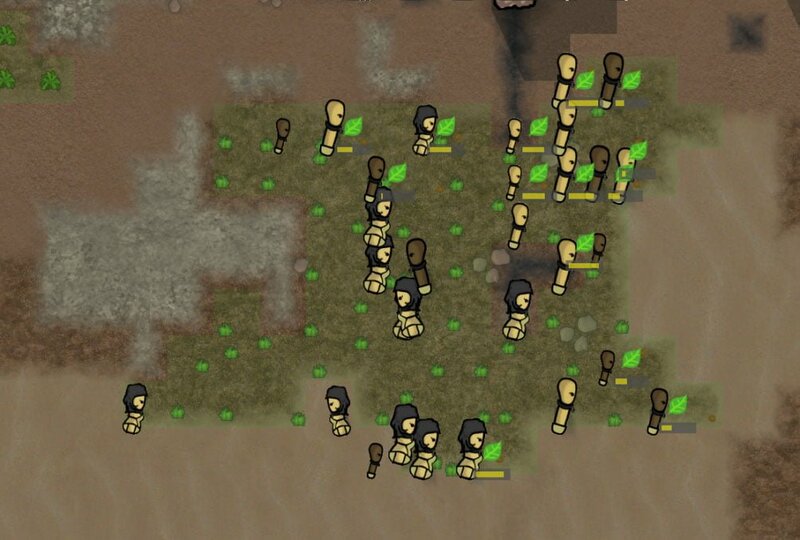 Walkblem Slaves can be purchased from your resident Walkblem Corporation on your planet, as well as from our franchised orbital trade ships that wanders around the RimWorlds. 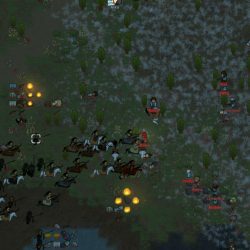 The Dothraki are nomadic horse-mounted warriors, who sweep across the vast central plains of the RimWorlds in search of plunder. Their reputation as fierce fighters attracted the attention of Walkblem Slavers Corporation, the corporation started selling Dothrakis as their latest warrior for sale. The Unsullied are elite warrior-eunuchs bred and trained by corporations under the Walkblem Slavers Holdings. These slave-eunuchs, who have been trained from birth to fight, are renowned for their utter discipline on the battlefield and loyalty to their assigned master. They do not act independently, will protect their master faithfully and will fight to the death upon being ordered to. Slavery is generally outlawed (and phased out due to glitter technologies) in most of Glitterworld Planets and the civilised planetary systems. However, slavery is still widespread in the Rim Worlds. Walkblem Slavers Holdings’ Work Slaves are the worst kept secret in the slavery market. Renowned for their absolute obedience and loyalty, they are considered a “safer” alternatives to “free slaves” that are already commonly sold in the Rim Worlds. Maidens serves as handmaidens and maids to the colonists who are willing to buy them. Their job mainly is to help out with the management of the house and its cleanliness. It is also heard that they give good massages to their masters. 5 types of slaves to choose from (according to your needs). There are 3 ranks of Unsullied – Infantry, Officer and Commanders. There are 3 ranks of Dothraki – Dothrak, Ko and Khal. Higher ranking Unsullied & Dothraki can fight longer and move faster than their subordinates (thus reflected in their cost). Dothraki essentially have 2 lives. When the mounted Dothraki is killed, it will respawn as a unmounted version of the Dothraki. Slaves can only be purchased via the resident Walkblem Slavers corporation(s) on the planet, or via orbital tradeships. You can also send a caravan to the nearest Walkblem Slavers slave camp to purchase your slaves. Slaves comes with different age group: child, teenager and adult. Child and teenage slaves are cheaper, but your morals will be tested. Sallys will make your colony, the happiest people on the planet (unless you hate women or you are too righteous). Maidens and Work Slaves takes care of different work. All slaves comes ready for work. Training is only required for Obedience (for assigning a master for them) and Release (if you want them as foot soldiers). 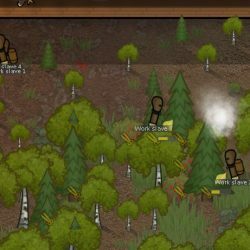 The RimSlave Mod will give a complete new approach to your RimWorld gameplays. Having slaves lets you focus on your colony’s expansion and war efforts. So put those slaves to work and fight the dothraki armies before it’s too late!